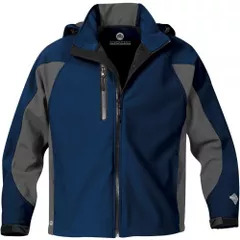 Shell: 86% Polyester, 14% Spandex, bonded with 100% microfleece. Waterproof chest pocket with audio port. Reversed-tape front zippers with full length inner. Water resistant: 8000mm, Breathable: 5000mm.